August - It's been a busy month. The highlight of this month is always the Northampton Balloon Festival but the passing of August also means the beginning of Autumn and shorter, cooler days. The weekends have been occupied with visiting friends, enjoying balmy summer evening barbeques and generally relaxing. 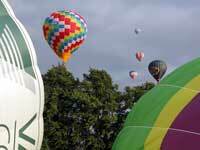 The fifteenth Northampton Balloon Festival started on the Thursday evening with some excellent weather but the prospect of some rain and windy conditions on the Friday morning. Steve did the inflation and the first half of the flight over the southern estates of the town with Nick taking control from just before Milton Malsor and eventually landing in a cut corn field next to the Courteenhall to Blisworth road. 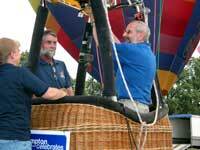 It was a relaxing flight alongside another fifty balloons and the farmer was very welcoming. Over the weekend the evening flights proved to be the easiest and the morning flights gave the pilots the greatest challenges. One of the pleasures of the Festival is the meeting up with old friends some of whom have moved on to pastures new. Glyn was flying the new Zirtek balloon which advertises a hay fever treatment - considering the kinds of fields we land it at this time of year this is most apt. We were also pleased to meet up again with Tony who has moved to Scotland for a different pace and quality of life. Sometimes the balloons become almost incidental as conversations roam across numerous and various topics. The Saturday evening was a little breezy and this photograph appears to show Steve going very close to the trees that surround the Old Racecourse although he swears he was a long way off hitting anything. This photo shows the unusual light, dark skies with the sun shining. The wind speeds eventually settled down and Steve had a good flight with a work colleague, Glenn, and his wife Wendy, eventually coming to land gently on Salcey Lawn in the middle of Salcey Forest. The retrieve, with Jane at the wheel, were there at the point of touch down and man handled the inflated craft across the field so that it could be packed away next to the road without having to take the vehicle onto the farmers land, even though the farmer had given permission. To round off the weekend Nick gave a flight to Val and Jane. This was a perfect ballooning evening with enough wind to clear town but gentle enough to ensure a relaxed and comfortable landing. Steve volunteered to retrieve, something he is not used to at the festival but was more than happy to do so that the "girls" got a flight. The evening sun onto the cut corn fields was magical and Steve watched from a distance as the balloon came into land over the combine harvester taking in the last of the crop and creating a massive dust storm behind it. 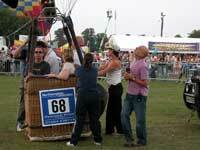 The photograph shows some very contented balloonatics at the end of a delightful weekend. 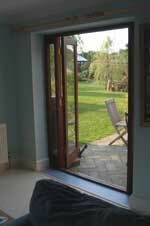 At the end of the month we eventually finished off the work done last month installing the patio doors. We repainted the woodwork and covered the newly plastered walls with the remnants of the same colour we used to decorate some years previously. The toughest job was filling the gap between the carpet and the door frame but we had some wood laminate that had been lying around waiting for just this kind of job so Steve fitted it, found some edging strip to join carpet and laminate and after a few hours work, and the usual cursing and swearing that accompanies any DIY job that Steve undertakes, the job was finished. He even took the time to fix the curtain rod ready for Jane to make the curtains. The only shame is that all this work has been done to the summer room and the summer is nearly over but we are determined to get some use out of it so we will move in through September and possibly October before we fly off to Australia. Long story re broadband failure, computer consultant visit (£££) + new computer (£££££££!). It's a shame when you contact the UK's national "communications experts", BT, to question their service and after the convoluted press numbers 1-23 for further numbers to press, you speak with someone who says: "It's not our fault/problem...good-bye" beeeeeeeeeeeeeep, hung up!! BT.....b*****ds! I could teach them a thing or two about communication skills if I ever meet the "customer care/service advisor" that hung up on me! Presumably he failed that part of the course.